The meat Turkey is a tasty low-calorie product, rich in vitamins A and E as well as iron, phosphorus, calcium and other essential human trace elements. This is one of the most useful types of dietary meat. 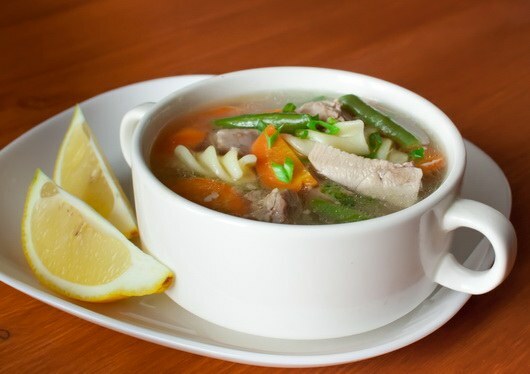 Cooked Turkey soups is recommended to include in the diet of children and adults. Turkey meat wash, put in a saucepan and cover with cold water. Then put the saucepan on a medium heat, bring to a boil, add peppercorns and Bay leaf. Reduce heat and simmer for one hour. If desired, the noodles can replace rice. It must be pre-rinsed for 5-10 minutes pour boiling water. Then the water should be drained, and the rice add to the boiling broth from the Turkey and continue the recipe to cook soup. After this time, remove Turkey from pan and let cool, then cut into small slices. Carrots wash, peel and cut into thin strips, about half a centimeter thick. In boiling broth put the green beans, prepared carrots and noodles. Continue to cook the soup. Answering the question of how long it needs to cook, chefs usually recommend that you remove the soup from the heat when the carrots are tender and noodles reaches the "al dente", that is already ready but not yet seethe and elastic taste. Put into the boiling soup slices of Turkey and cook all together for 2-3 minutes. Ready soup remove from heat and allow it for ten minutes to infuse. Before serving, add bowl of soup with finely chopped greens. To prepare the soup for this recipe, you will need three-liter pot. Turkey fillet wash, put in a pan and pour the meat with cold water. Put the saucepan on medium heat and bring the water to a boil. Then put a teaspoon of salt, pepper (black and sweet), Bay leaf and simmer the broth for 20 minutes after boiling. Then remove meat, cool and slice into pieces. Potatoes and carrots wash and clean. Potatoes cut into cubes of medium size, and carrots grate on a coarse grater. Cleaned from the husk onions also cut into cubes. Processed cheese RUB on a grater or cut into cubes. In France, the cheese soup, the Turkey is usually served with toast. Drop in boiling broth of potatoes, cook it for 7 minutes. At this time, in butter lightly fry the onions with the carrots. Add the browned vegetables to the potatoes and cook for 5-7 minutes. Then put the slices of Turkey. Soup continues for another 5 minutes. Then place the prepared cream cheese, mix everything well and remove the pan from the heat. Before serving, sprinkle with cheese soup of chopped greens.